While travelling along the B96, en route to another abandoned sanitorium, we noticed a grey monument at the side of the road. We saw it too late and were driving too quickly to turn in and take a look. We promised ourselves to look for it on the way back and I’m glad we did. It turned out to be one of the most unique monuments we’ve found so far. There are lots of Soviet monuments throughout what was East Germany. And it’s understandable. According to Wikipedia, defeating the Nazis cost 23,400,000 civilian and military Soviet lives – by far the highest number of any single state. Making ‘heroes’ out of the ‘fallen’ is what everyone does. Soviet sites like Treptower Park are no different and typically, the dead are represented as square-jawed, square-shouldered and heroic figures. But they don’t say much about the actual systems these soldiers were fighting for. If the 20th century was all about clashes of ideologies, it’s good to get a clue of what those ideas were. Heading back to Berlin, we remembered to turn off the B96. There are two monuments there but the first to catch the eye commemorates the battle for Berlin. It lists numbers of Soviet planes, tanks and troops used in the campaign. It also shows some kind of route, perhaps the route they took to get to the German capital? It’s hard to say – it’s all in Russian. I could find only one reference to this monument online (in German). 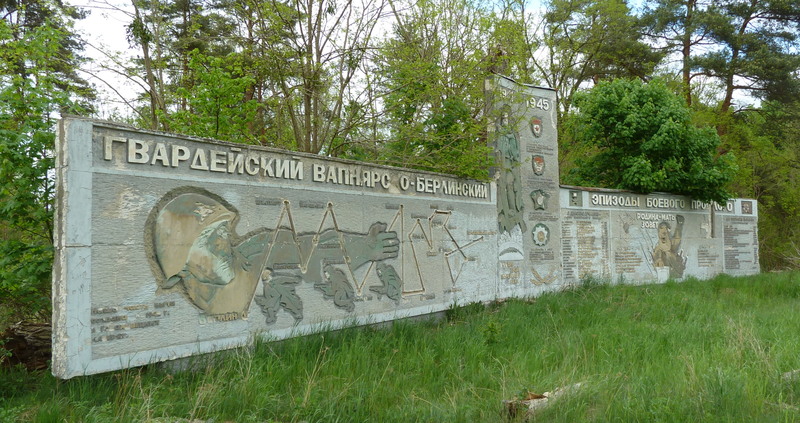 Apparently, it marked the entrance of a Red Army barracks and tank repair facility. From a look at Google Maps, it looks like it used to be quite a large site. Opposite the war memorial is the second a monument. After a few minutes of theorising, we realised it was a monument to something absolutely central to the Soviet Union. And central to every other Eastern Bloc state too – the planned economy. I’m no economist. I don’t really know how planned economies worked. I should also say that I’m not condoning or criticising any of the former Eastern Bloc dictatorships. The monument just got me thinking about the idea of a planned economy – and for those who know slightly less about them than me, I thought I’d try to explain my understanding of them. Electricity, oil, gas and coal. As we’ve seen in recent years, stock markets can fail. The system of money/capital is far from perfect. It’s unpredictable, virtually uncontrollable and it leads to vast inequality. Perhaps above all, it’s amoral. Profit is all that matters. Planned economies were designed to regain some control, remove uncertainty and provide employment, products and services. It didn’t matter what investors on Wall Street or at the London Stock Exchange did. There was no more boom or bust. Planned economies tried to look at available resources, at what society needed and put everyone to work to produce it. For many communist or socialist states, planned economies took the form of Five Year Plans. The government set targets for growth – if we need more than our current milk production of 20 billion litres, let’s aim for 40 billion litres in five years. If we need more electricity, let’s build some power stations and pylons – and train enough engineers, technicians and electricians to make them work. From food to fashion, doctors to dockworkers, toothbrushes to televisions – everything was part of the plan. Wheat, meat, milk and sugar – the smaller icons being the lower production output of 1985, the larger icons representing the higher ‘planned’ output for 1990. When you’re in the middle of a euro crisis; when bail out after bail out fails to impress the financial markets; when trillions of pounds, dollars and euros are being spent yet everyone is facing cuts to public services, you can see the appeal of a system that apparently gives everyone employment and certainty for at least the next five years. In it’s simplest form, this is all that communism was supposed to do: take power from markets and shareholders and give everyone a common goal. No more 1% at the expense of the 99% – everybody owns everything. At least, that’s the idea. In many ways, it’s strange that a different way of running an economy could cause such uproar and offense in the West – though I realise this wasn’t the only thing about the Soviet Union that upset people. 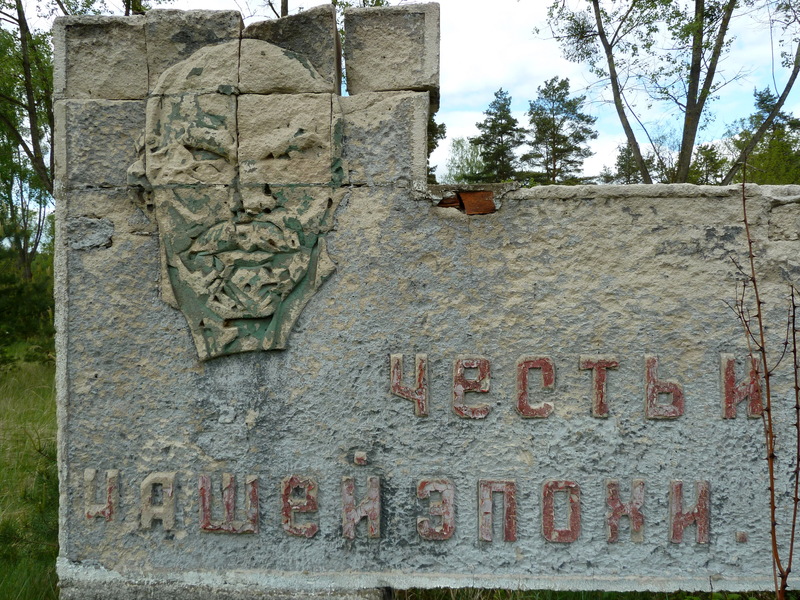 Lenin’s head, a little worse for wear. In purely economic terms, I can see why so many people in the West oppose a system that deprives them of profit. It threatens the very fabric of our society. And for those who tell me how virtually bankrupt the Eastern Bloc states were by 1990, I’m sure you’re right. But were they any more bankrupt than Europe’s massively indebted capitalist economies today? And think of the waste. Has there ever been a more wasteful system than capitalism? Seriously, these aren’t rhetorical questions. Being a left-leaning kinda guy, the basic idea of a planned economy doesn’t sound so scary to me – but I’m also aware of the downsides. Deciding today what we’ll be doing in five year’s time isn’t the best recipe for innovation. Shortages were common but even if they met the targets, factories weren’t supposed to exceed quotas either. Production was often slowed down, not very competitive or even concealed – there was a lively Black Market. Taking cars as an example, by the end of the Soviet Union, Eastern Bloc cars were poor in comparison to many of their western counterparts. Western cars had decades of development in a very competitive market. Love ’em as I do, a 1989 Trabant was still essentially based on 1950/60s design and technology. As Eastern Bloc production went, you got what you were given and you usually had to wait a long time to get it. Fashion was a particularly visible example. Don’t get me wrong, fashion and I have never been best mates. It would suit me if everybody wore boilersuits, but by the time the state had instructed factories to produce flared trousers (for example), fashion had already moved on. There was a cynicism amongst Soviet consumers that if a shop had enough of a certain type of clothing, it was a sure sign that it was out of fashion. I realised a long time ago that many of my hobbies and interests have been provided for by a market economy. For example, my film My DDR T-Shirt was only possible thanks to market forces making camcorders and flights to Berlin affordable. And just think how far mobile gadget technology has come in five years. I don’t know when the monument to the planned economy was built, but it was designed to be updated with every new five year plan. All the staples are there: coal, electricity, oil, gas, meat, bread, milk, wheat, sugar, cotton and fertiliser. All with a little white panel for someone to write the period and quantities for each product. You can still make out the period for the last five year plan – 1985-1990. Whether they hit the targets or not, the monument looks untouched since then, apart from the occasional vandal. The whole thing stands like a time capsule to an idea that withered and faded away. Like a giant sundial that doesn’t get the sun anymore. The Soviets made some impressive scientific and technological advances – in space travel, for example. Still, I think it’s hard to imagine a Soviet iPhone – but maybe it’s just as hard to imagine secure employment, subsidised housing and some of the other things that people appreciated about a planned economy. I love my smartphone but I don’t trust the markets. So, what does that make me? BBC filmmaker Adam Curtis made a fascinating documentary about the Soviet economy called The Engineer’s Plot. It includes interviews with the beaurocrats of Gosplan, the Soviet government department in charge of setting prices and production targets. It was part of his Pandora’s Box series and you can download complete episodes for free at Archive.org. Glad you liked the post and thanks for the translation. I tried Google Translate on some of the things. I could guess at things like electricity and milk etc (the symbols/icons were obvious) but I needed some help with fertiliser! As a teenager in Canada, in the 80’s…. Their were two certain impending deaths that we were forced by our parents and the media to prepare for, and possibly face… AIDS… and WW3. On Russia however, we got taught huge volumes about they’re history and political system, including the idea of a planed economy , in our social studies classes ( probably because the province was building Vancouver’s Expo 86 at the time. And they wanted the youth to be seen as great hosts. Or at least not appear completely stupid when foreign visitors approached us.) From those social studies classes I ended up developing an incredible fascination about Russia. As a student visiting Expo in 1986 I spent every hour I could at the sites Soviet Union Pavilion. the largest foreign pavilion, even larger than the Washington State pavilion. Reveling in it’s full scale, walk thru mock up of the MIR space station centre section, and probably annoying the hell out of the russian tour guides to the structure. I certainly remember all the fear of WW3 and AIDS. Nuclear war was a constant worry and one that’s hard to explain to people who weren’t around or old enough to remember it. Every band of the 80s had their anti-nuclear song and the nuclear mushroom cloud was an icon of the time. The UK had also had some utterly inadequate public information about AIDS. Most infamous was the “AIDS: Don’t die of ignorance” campaign. It offered an apocalyptic view of the threat of AIDS. It’s laughable now but it pretty much terrorised the population at the time. I liked that you showed the upside of the planned economy, I don’t think many people see that nowadays. The one thing that they got definitely wrong though was that they took demand out of the equation. ‘Consumers’ had to adjust to what was produced and not the other way around. Why have a five year plan if you don’t plan enough products to last for everyone? I admit, resources might have been one reason. But that way people ended up waiting 10 years or more for a Trabant to be delivered (on the upside that gave you actually time to save up the then gigantic sum of almost 10 000 GDR marks), and there was a general lack of consumer goods. So East Germans became completely hyped up by the consumerism they saw in the West, which might account for the pictures on TV after the Wall came down: loads of East Germans scrabbling over cheap products in places like Woolworth on the day they crossed the border for the first time. Living in the Eastern bloc was not a quick walk to the next shop if you needed something but a constant give and take, organising, knowing someone who knows someone who can fix things and just generally sorting where things came from. Exhausting as it was to do this on a daily basis, it also meant that you would appreciate and preserve things more than people seemed to do in the West. This if-it-breaks-we-throw-it-away attitude didn’t exist and if you look around the world today, it seems mainly to be ingrained in the Western world. Thanks for the extra insight, Jumen. 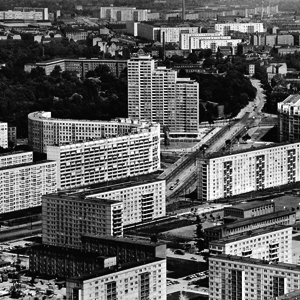 It’s always good to get an idea of what it was like from an East German’s point of view. First: thanks a lot for the super interesting post. Gotta go. This entry was posted on 22/06/2012 by hawkinsian in abandoned buildings, architecture, planned economy, Propaganda, Uncategorized.